The Via Combusta (fiery road) is a small stretch of sky, usually defined as mid-Libra to mid-Scorpio, that is seen by astrologers as A Bad Thing. The Via Combusta (fiery road) is a small stretch of sky, usually defined as mid-Libra to mid-Scorpio, that is seen by astrologers as A Bad Thing. When the Moon is there, it bodes bad results for horary astrologers, shows serious problems for electional astrologers and can be generally worrying for other astrologers. Throughout the centuries, astrological writers have been extremely reticent about the Via Combusta, seemingly assuming that it’s so mind bogglingly obvious what it means that they needn’t waste words writing about it. The truth is that the Via Combusta is so ancient, we can no longer be sure from where it originated. But we can explore where the idea of the Via Combusta might have come from and why it endured as a concept for so many centuries. Additionally, this book examines how it has been interpreted by astrologers in the past. The Via Combusta is a small stretch of sky. And this is its story. Author of several astrological books, Kim Farnell is currently President of the Astrological Lodge of London and holds an MA in Cultural Astronomy and Astrology. 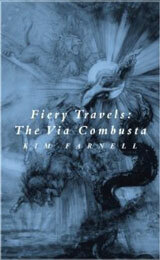 Be the first to review “Fiery Travels: The Via Combusta – Kim Farnell” Click here to cancel reply.